A bundle of commercial use premium graphic design files and OpenType fonts to use on Mac or Windows. Only $29.99 for a limited time, plus you get 1,313 OpenType fonts! (total value is $478.90)! Add a bundle of creative elements at an unbeatable price! The Mini Design Bundle packs together an imaginative set of logos, logo graphics, website buttons, icons, backgrounds, price boxes, and talk bubbles. Everything is royalty free for commercial use, and includes high-resolution image formats as well as the original PSD (Photoshop), EPS or AI (Illustrator) source files. 4 icon sets are included: Mobile, Application, Web, and General. Each contains the original AI and EPS source files to edit as needed, as well as transparent PNG versions of each icon in the following pixel dimensions: 16×16, 32×32, 64×64, 128×128, 256×256, 512×512, and 1024×1024. The Mobile, Application, and Web icon sets also include both Active and Regular states! This image at the top of this page shows a small sample of what you'll have at your fingertips. Looking for a unique logo for your own business, or would you like some new creative options you can use to design logos for clients? 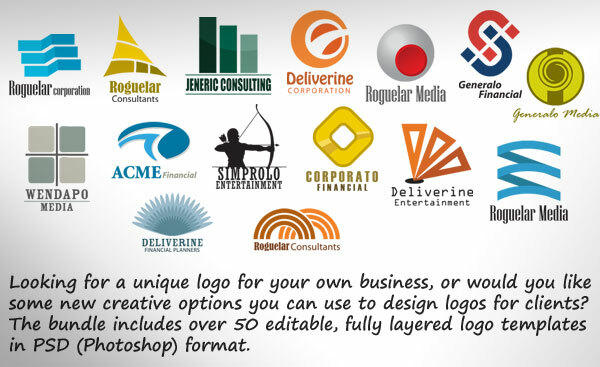 The bundle includes over 50 fully layered logo templates in PSD (Photoshop) format. Simply open these in Photoshop and change the name and/or look of the templates to make your own. 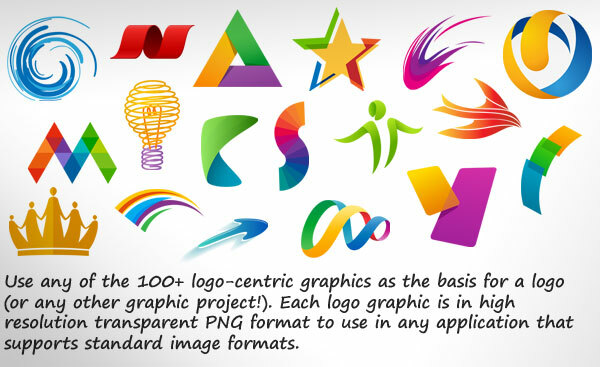 You can also use any of the 100+ logo-centric graphics as the basis for a logo (or any other graphic project!). Each logo graphic is in high-resolution transparent PNG format to use in any application that supports standard image formats. Have something to say and want people to notice? Grab one of the eye-catching talk bubbles and place your text inside to quickly attract attention. These talk bubbles are not your ordinary, boring round shapes. 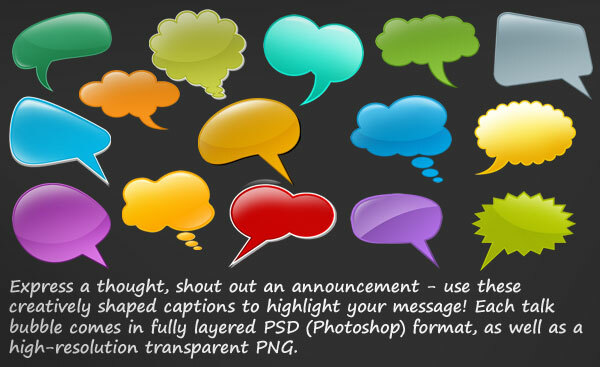 Express a thought, shout out an announcement – use these creatively shaped captions to highlight your message! Each talk bubble comes in fully layered PSD (Photoshop) format, as well as a high-resolution transparent PNG. Apple leads the way in stylistic design for everything they create. The website buttons included in the bundle follow in their design footsteps, making it easy for people to notice and read what they are clicking. These buttons are in fully layered PSD (Photoshop) format, making it easy to edit and save to use in your own website design work. Price boxes are great attention grabbers and the perfect way to advertise a product, service or special offer. 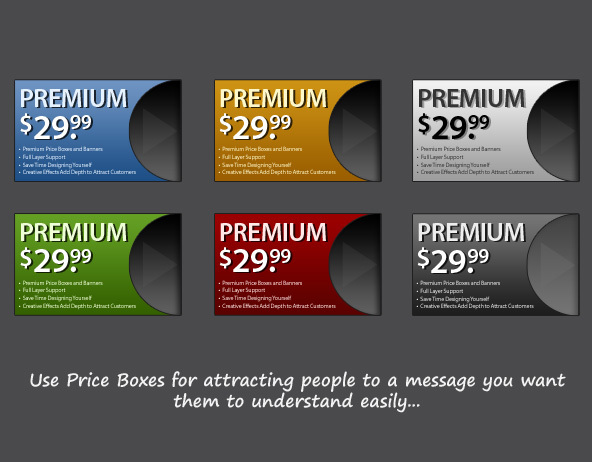 Since these prices boxes are in fully layered PSD (Photoshop) format, you can quickly add your own information, change colors or shapes, adjust the size, or anything else your heart desires. Then save them in any standard image format and use as a web banner, advertisement, callout, and more. Use background textures to add knock out or subtle effects in any design project: email messages, website pages, advertisements, cover pages, brochures, banners, text art, and everything else. Each background is in high-resolution JPEG format to use in any application that supports standard image formats, or feel free to make changes using the original layered PSD (Photoshop) file. Files are delivered as an instant download (about 300 MB so be patient during download). Files can be used in an unlimited number of personal or commercial projects. Tired of the same old fonts? Need to change up the text style in a presentation, print project or a graphic design project? Get 1,313 brand new premium font designs from MacAppware. This collection now includes 101 original font families, with a total of 1,313 fonts in all. Each font is in OpenType font format and can be used for any personal and business project on both Mac and PC computers. International character support is standard for every premium font. Each premium font in this collection just came off our design floor. Click here to view all current font families. Click here to see examples of Premium Fonts. MINI DESIGN BUNDLE REQUIREMENTS: Mac OS X 10.4 and later, or Windows XP and later. Requires Adobe Photoshop for PSD and EPS files, and Adobe Illustrator for AI files. PREMIUM FONTS REQUIREMENTS: Mac OS X 10.1 and later, or Microsoft Windows XP and later.